India is called as the land of culture and rich traditions and we, Indians respect them a lot and is one of the oldest civilizations in the world.the richness of Indian culture is unique in its own ways. We celebrate all the festivals with equal zeal and vigorwhich proves the Indian motto of unity in diversity. Makar Sankranti, also known as pongal, lohri. The festival is not only a celebration of Hindus but it is actually based on a universal phenomenon. The festival is based on science and astronomy & crop cycle which is not limited to any particular religion. Basically, it is a celebration to observe the day which marks the shift of the sun into ever-lengthening days. The festival is moreover a seasonal observance as well as a religious celebration. The festival is a celebration of India’s main source of strength, living i.e. our farmers. It is primarily a harvest festival which is commemorated all over India. 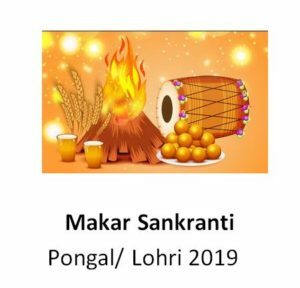 The mankar sankranti is famous in the western parts of India while it is called as Pongal in the south, which is a four-day festival and is celebrated as lohri in north India. The festival is also called as Uttarayan, Maghi and Khichdi in some other regions as well. It is well renowned and also celebrated not only in India but also in other countries such as Nepal, Bangladesh and Pakistan (in Sindh region). In the state of Uttarpradesh the makar sankranti is generally comes in the beginning of Kumbh Mela whereas in Kerala, the southern part of India the major and difficult pilgrimages of Shabarimala ends on this auspicious day. On this day, on this festival people take a dip in the waters of river Ganga, Yamuna, Godavari, Krishna and Cauvery(Kaveri) which is believed that it cleanses and washout all the sins. Also, people pray to the sun and thank it for the success and prosperity. People make sweets (Tilgul) made with sesame seeds (Til), jaggery(gud) and share them with everyone which is a joyous side and share the love. The sweet which is called Tilgul is considered as the symbol of togetherness and bond between the people in peace despite differences and diversity that made our country stands united in diversities.